The debate as to what is or is not a snack food has raged for many years. Surveys have suggested that the snack food category encompasses sandwiches, fish and chips, and other take-away foods, as well as potato crisps, chocolate bars, sweets, and other confectionery. Whatever is included under this heading, the prime driving force is the change in life styles created by increasing consumer affluence. Different products have been considered as ‘snacks’ in different parts of the world at different times, indeed, what is an ‘ethnic’ food in one country can now be viewed as a ’snack’ food in another as exposure to different cultures is facilitated by cheaper air travel. 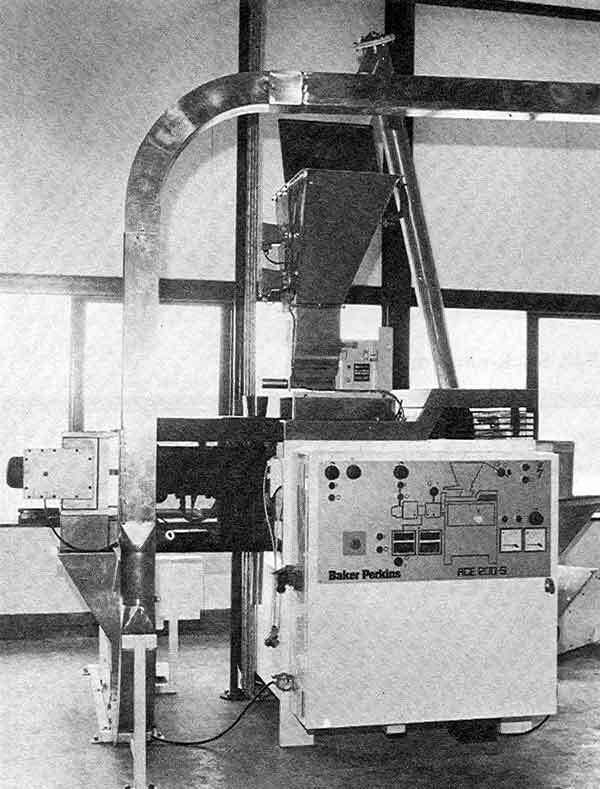 Baker Perkins Holdings’ Market Research Unit (see also The Holdings Building) carried out detailed market surveys on the opportunity for snack food machinery in the USA and Europe in 1973/74. This took as its reference point that a ‘snack food’, in the context of Baker Perkins’ interests, would be one that is cooked in some way, produced under industrial conditions, and would be packaged in individual ‘snack’ quantities for sale primarily through similar retail outlets to those used for biscuits and sugar confectionery. The survey included potato crisps but this opportunity was dismissed fairly early in the work as Baker Perkins did not have expertise in frying and the potential growth in the market did not justify acquiring this technology. One particular product did however figure in the research, a new product called Pringles – a ‘pre-fabricated’ potato crisp (or as the Americans call them – ‘potato chips”) - was just entering the market. This led to an examination of a new generation of snack foods that were produced using the, then, new technology of cooker-extrusion – usually in a fairly simple single screw extruder. Although at the time of the survey, the snacks being produced in this way were relatively crude, the market potential was very significant in both the developed and developing worlds. These new foods were competing for the same portion of an individual’s ‘food consumption dollar’ as was being spent on biscuits and confectionery, so the growth of cooker extruders could therefore threaten future sales of the group’s existing range of equipment. The survey suggested that there was a market for a better single screw extruder but that the rapid growth of consumption would lead to the development of new snack products that would need a more sophisticated twin screw device. In 1979 the decision was taken that the group should develop a suitable range of equipment to meet both of these opportunities. Baker Perkins already possessed significant experience of extrusion through its involvement in plastics compounding (See History of Baker Perkins in the Chemical Business) and it was decided that Baker Perkins Ltd at Peterborough should develop a new single screw extruder while Baker Perkins Inc, Saginaw (later in Raleigh and Goldsboro) would use their existing range of plastics/chemical machines as a basis on which to build a new twin-screw model. The snack food business was, therefore, one of the youngest businesses in the Baker Perkins group but one which grew rapidly. Here we are reminded by Peter Hornsby - a member of the original 1950s Baker Perkins Plastics Machinery team - that "back in 1960/61 in the then Experimental Department while working on a new product range of Plastic Extruders we were asked by our Sales Department if we could run a test for Kelloggs and attempt to extrude cereals. Kellogg's personnel arrived and ingredients were fed into the machine hopper. However the extruder screw proved to have too high a compression ratio and because the feed stock was too viscous, it blew the die head off the extruder barrel and covered all present with exploding product. Experimental trials often fail and we never got another chance to enter a new market". The process itself is relatively simple. Cereal, typically maize or wheat, is fed into the circular barrel of the extruder, a screw pushes the product towards the outlet point, compressing the material as it does so to an extremely high pressure (around 2,000psi). The compression heats the cereal to around 180 degrees C and changing it into the form of a syrup. It is then extruded through a die at the outlet of the machine, the natural moisture flashes off and the product expands into a cellular structure, having a volume about 30 times greater than the original raw material. The product might then be dried to remove the remaining moisture before having oil and flavour added to its outside surface. For snacks the end product is about 30 times greater in volume than the raw material that was put in. If the snack is cooled just before extrusion, there is no steam flash-off with the result that, after drying, is small pieces of easily stored and transported product which simply require frying before packaging for sale. This means that a basic product can be produced centrally and then shipped anywhere in the world to be fried locally. Many snack products – for instance those highly flavoured crisp-type products that children enjoy – can be made on a simple single screw extruder but new products are being produced everyday which require more sophisticated and controlled production. 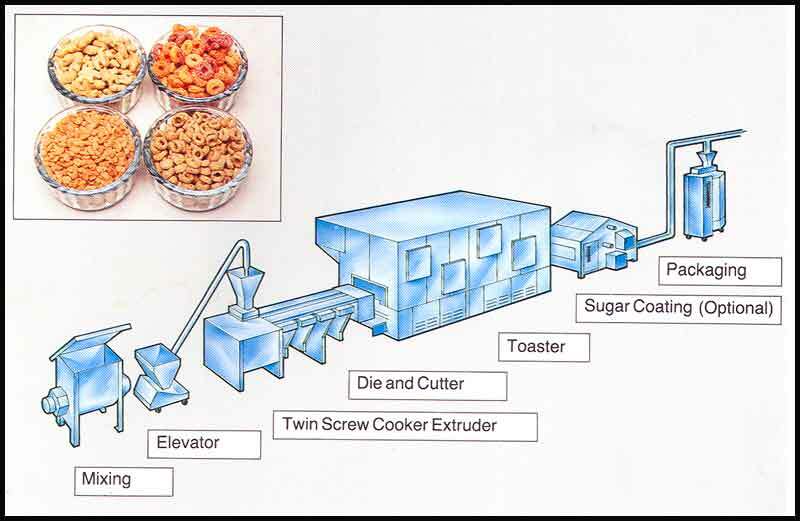 A typical example would be crispbread and for this a twin-screw extruder would be used. Great accuracy would be required because the product was packaged and sold like a traditional biscuit or crispbread, so the manufacturer needed the greater flexibility that the twin-screw machine could bring. After being extruded, the crispbread would b cut into biscuit-sized pieces and then toasted top and bottom. 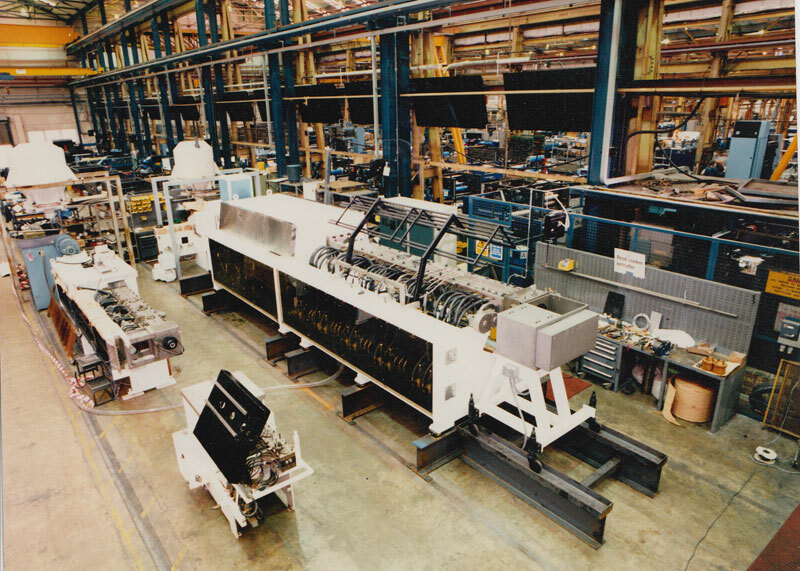 Single screw cooker-extruder Twin-screw cooker-extruder Interior of twin screw Cooker-extruder Twin-screw food extruders being assembled at Westwood in 1988. Although they do a similar job, there is a world of difference between a single screw and a double screw extruder. 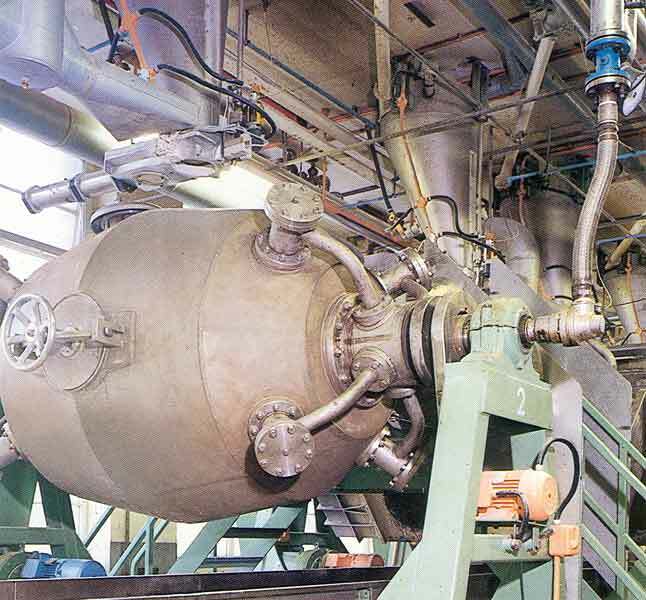 The twin-screw machine is a highly complex engineering product. Its twin screws can be made up of as many as fifty separate components. These can be interchanged by the processor to give great flexibility and allowing an almost unlimited number of combinations of mixing time, pressure and temperature within the extruder to suit the product being processed. Demonstration and process research facilities were set up at Baker Perkins Ltd, Peterborough and at Baker Perkins FES Inc in the USA. Here the customer could work with Baker Perkins process technologists to create innovative new products. The ability to develop new products with parallel work in the UK and USA was found to be particularly useful when dealing with multi-national food companies. To take full advantage of this, in August 1984 it was announced that the Raleigh, North Carolina based Food Extrusion group would report to the Biscuit & Confectionery Division of Baker Perkins Ltd., Peterborough.The North American Food Extrusion group would continue at the existing location and with existing operational arrangements. 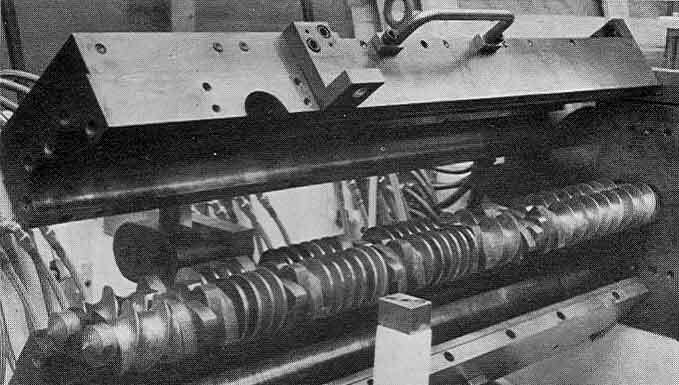 Baker Perkins Chemical Co. (BPCM), at Stoke-on-Trent would continue to manufacture twin-screw food extruders up to and including 100mm. The type of product to be made by cooking- extrusion is limited only by the imagination. As well as snack foods, sugar confectionery, biscuits, baby food, crispbread, pet food can all be produced using cooker-extruders. Although not perhaps coming strictly under the heading of ‘snack food’, significant progress was made in the production of breakfast cereals by cooking-extrusion. Cold, ready-to-eat have been produced from the beginning of the last century and are an accepted part of everyday life throughout the English speaking world. The health food boom, coupled with changes in work and living patterns, resulted in a decline in the traditional cooked breakfast, and fuelled a steady increase in the consumption of breakfast cereals of one sort or another - even in those parts of the world not traditionally associated with such products. New formulations appear every day – made from corn, rice, wheat, oats, bran – or a combination of these – all claiming to bestow some particular benefit on the consumer. The sector rapidly grew into a sophisticated, highly segmented and dynamic market. Baker Perkins had entered the breakfast cereal machinery market in 1975. Douglas Rownson (see History of Douglas Rownson) was asked by an agent in Manchester to quote for some cereal pressure cookers for a customer in Europe. Derek Hill, then manager of Douglas Pumps Ltd, remembered that Douglas had supplied similar ones when they were at Putney. An order for two cookers was obtained, the original drawings were found and Steele & Cowlishaw were asked to fabricate the cooker shells and stands, final assembly being carried out in Basingstoke. 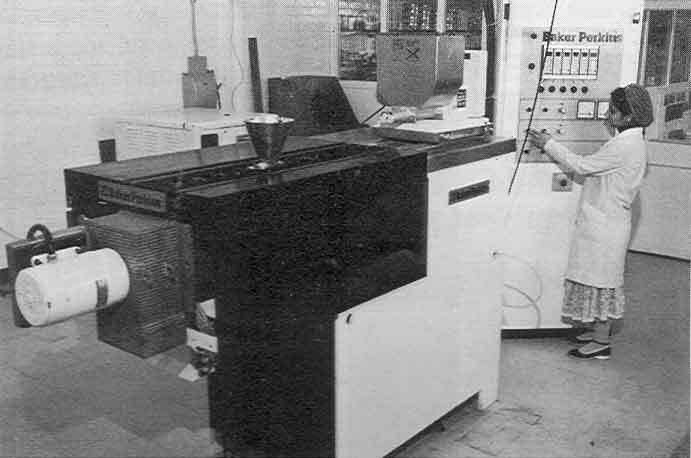 Derek Hill tells the story of how this equipment was developed in The History of Douglas-Rownson – Douglas Process Engineering, 1979. 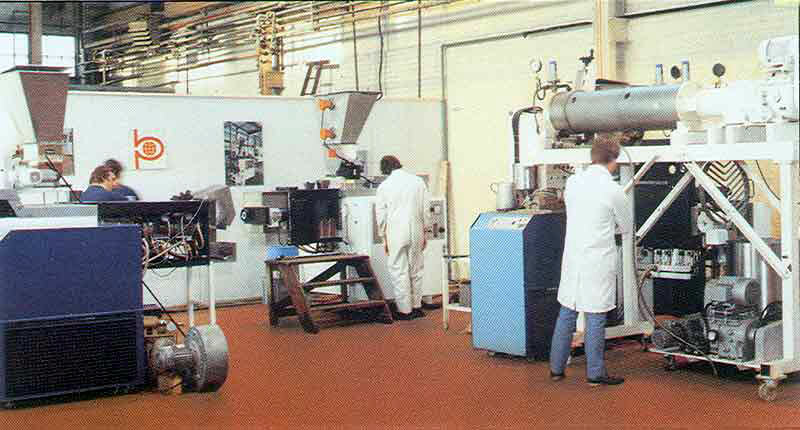 Sales of breakfast cereal equipment to the leading international food companies rose rapidly and the assembly of cereal cookers was transferred from Basingstoke to Westwood Works, Peterborough in 1984. The first batch of 4 was completed in January 1985 but the Cooker shells were not clad in stainless steel as were those shown in the photograph below. 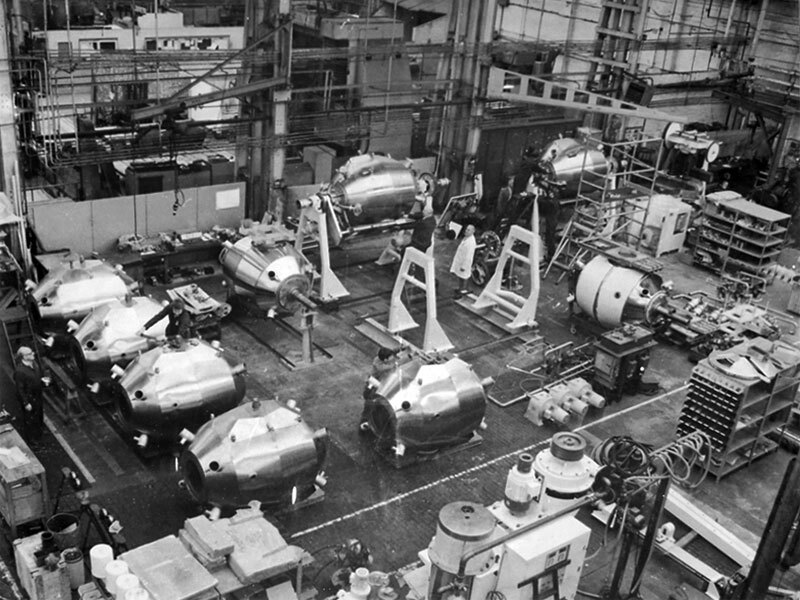 A superb photograph taken by Clive Read of a batch of 10 Cereal Cookers being assembled in KL Bay of Westwood Fitting shop (see here) in late 1985. Staff Thomas (fitter) and Derek Smith (foreman) can be seen in the middle background with Harry Wilson on the extreme LH side. The stainless steel cladding is evident, the gap between this and the main cooker shell being filled with a special foam. 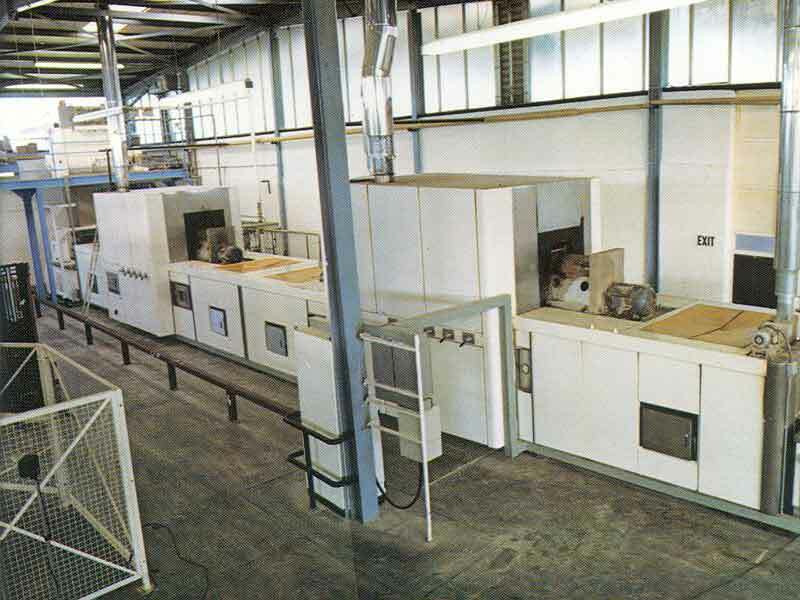 A second batch of 10 cookers was built in early 1987, followed by 2 batches of 2, before food machinery production ceased at Westwood in August 1991. Production then began at the new APV Baker factory in Paston, Peterborough with another batch of ten being completed in August 1992. Expanded cereal production - based on the twin-screw cooker extruder. 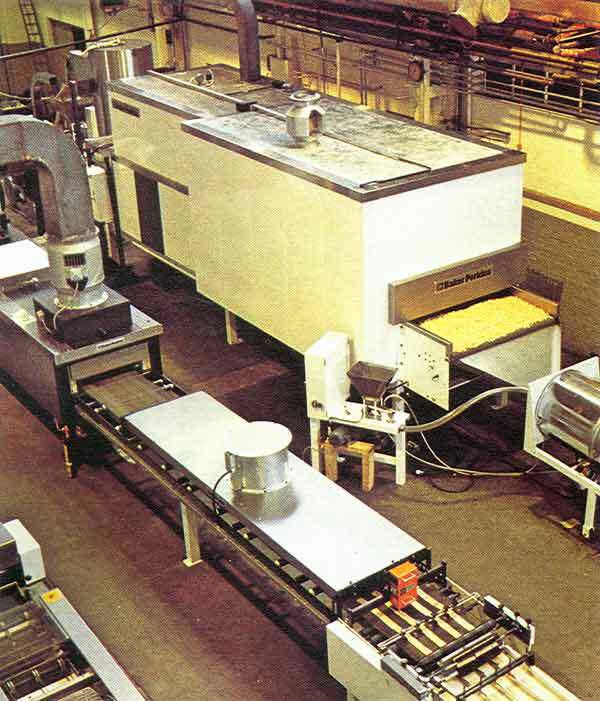 Flaked cereal production – based on both single – and twin-screw cooker extruders. 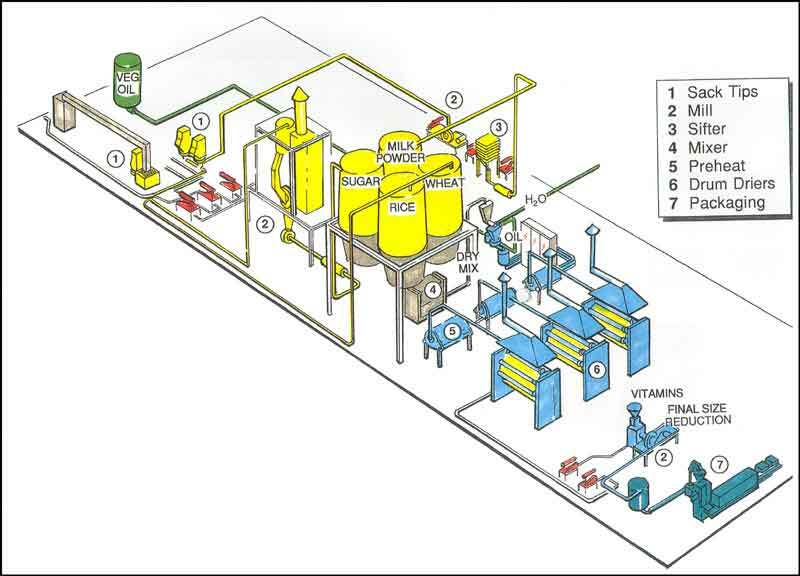 Flaked cereal production – based on the traditional rotary cooker. Shredded cereal production – based on both single- and twin-screw cooker extruders. Shredded cereal production – based on the traditional rotary cooker. 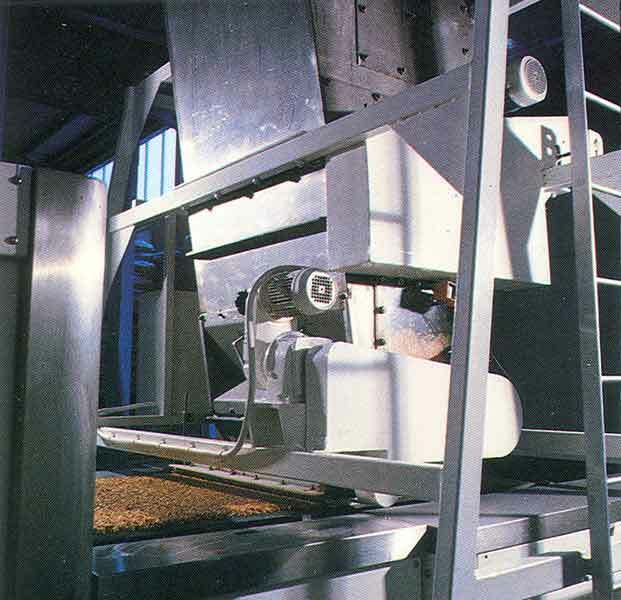 Plants for muesli- style products – capable of manufacturing both a kibbled product or muesli-style ‘health’ bars were also developed in which the muesli was chopped, and spread across a conveyor band. An adjustable gate fed the product across the band and compressor rollers controlled the thickness of the sheet. The product was then baked in a continuous oven, followed by kibbling for loose packaging or cut into blocks to make ‘health bars’. 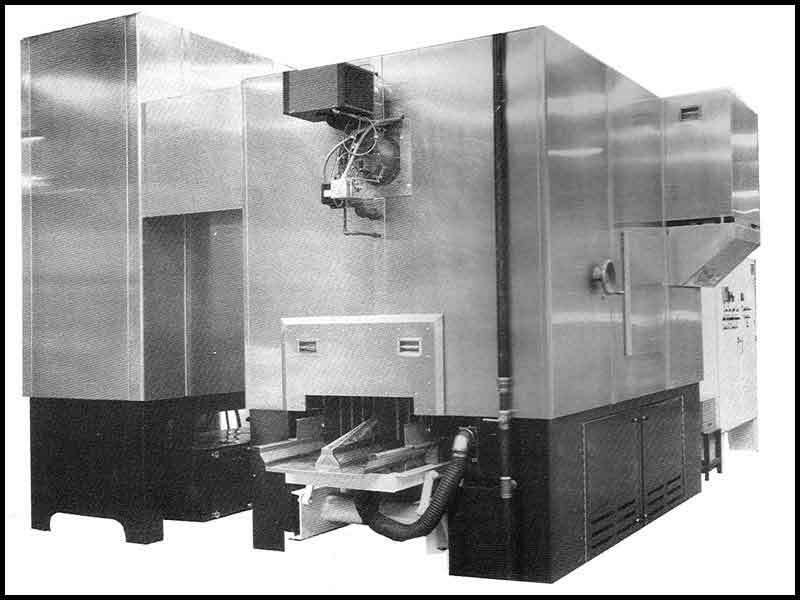 In 1982, Werner Lehara acquired the manufacturing rights and patent licences for the range of pretzel extruders made by the Unex company, the market leaders for this equipment in the USA. Added to Werner Lehara's existing range of pretzel equipment, this allowed the company to design, engineer and manufacture complete production lines – mixing, extruding, proofing, baking and drying – for both hard and soft pretzels. 1984 - The completion of the divisionalisation process of Baker Perkins Ltd was manifested in the creation of three new companies of which one - Baker Perkins BCS Ltd, under J.P. (Paul) Parkinson - consisted of the biscuit machinery operations together with the rapidly expanding chocolate, confectionery and snack food businesses. 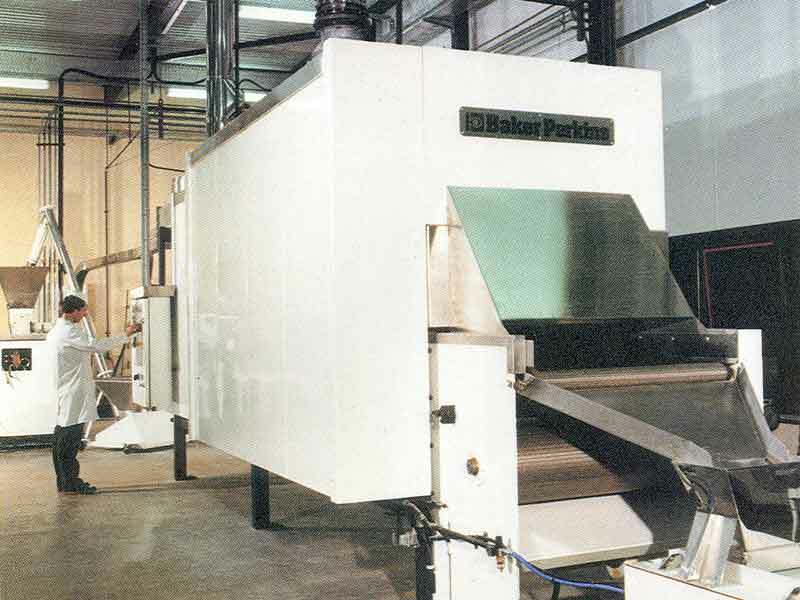 In 1988, Werner Lehara, now named APV Baker Inc., introduced the Thermoglide processor – a device utilising a closed circuit air system to bake, dry, roast, toast, puff or cool particulate products – which, added to the long-established expertise existing in the ex-Baker Perkins businesses, allowed the company to offer an unmatched processing capability to this diverse and technically sophisticated sector of the food industry. 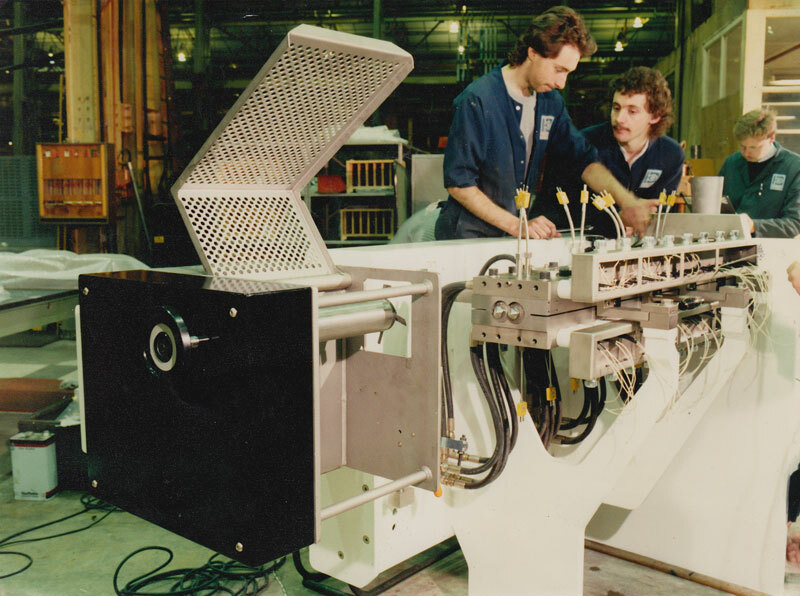 Back in 1983, Baker Perkins’ project engineering capability had taken another step forward when the Special Projects division was created. (See also History of Special Projects). 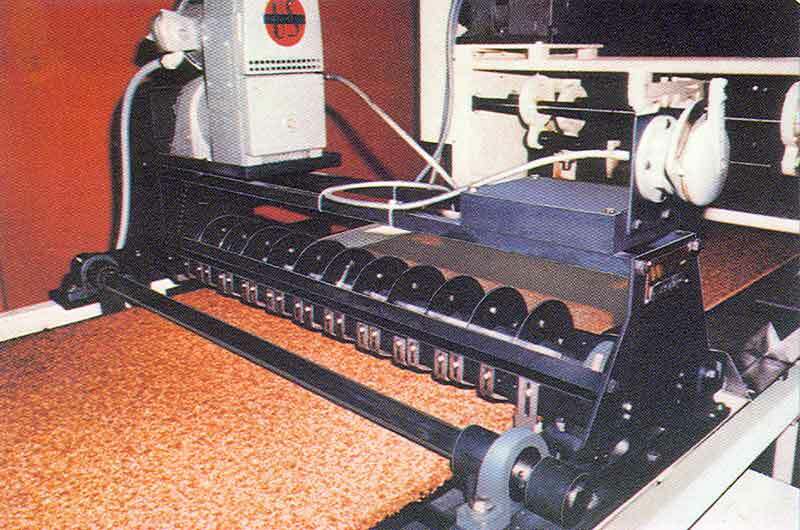 In 1989, the Special Projects Division used the company’s cereal technology in fulfilling a £50 million contract to supply ten breakfast cereal lines to the Soviet Union. All ten plants were to use locally grown maize, wheat, oats and rice to make five different breakfast cereals in each factory. Four of the products were first extruded in a twin-screw extruder having the capacity to produce 4000 tonnes a year. 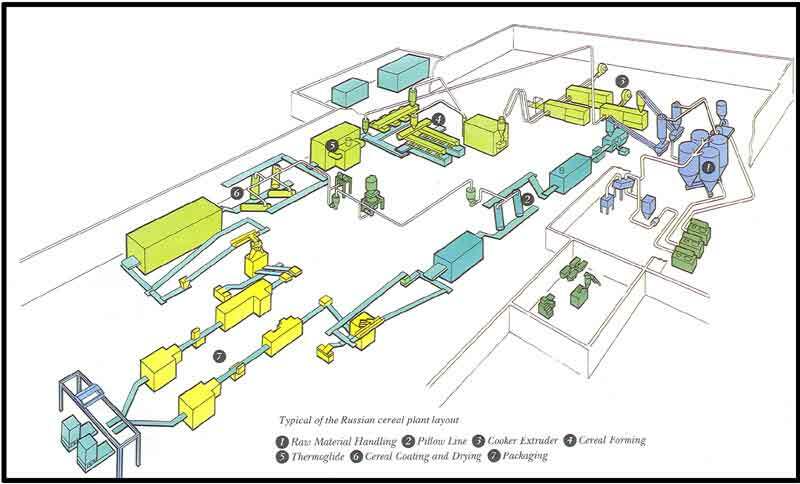 Special Projects supplied all of the fully- automated equipment through to the warehouse and, as breakfast cereals were a brand new product in the USSR, also provided special training programmes for the Russian plant and process operators. This was followed in 1991 by a £4m contract to supply a dried cereal based baby food plant to Iran, working in conjunction with APV DTD of Denmark. The baby foods were based on wheat, rice, milk powder, sugar, oil minerals and vitamins. The cereal grains were cleaned and milled before mixing with other ingredients and water, pre-cooked and then dried on drum driers. In August 1991, the snack food business moved, with the rest of the ex-Baker Perkins food machinery business, to the new APV Baker factory in Paston, Peterborough – see Leaving Westfield Road. All content © the Website Authors unless stated otherwise.